When Britmums said they would be doing a challenge with Ace, I jumped at the chance to try these stain removing products, with a pre-teen and a pre-schooler there’s always some stubborn stains that I struggle to remove. As part of the challenge we were given 1 bottle of Ace for Colours and 1 bottle of Ace Stain Remover. apron! However when it comes to meal times it’s another story. Georgia loves baked beans...clothes...as we know...don’t love beans! marks along with a splodge of tippex here and there! persistant odors you can also use this as a pre-treatment. have the ground in dirt that’s there now. work. It faded them slightly but didn’t remove them altogether. thought I’d give it an extra test! buy head to your local Tesco’s, Morrison’s, Waitrose or Sainsbury’s. while we celebrate Oreo’s Great Cookie Quest. by just using their facial muscles. Oh the hilarity at watching them try to do this. Here I’ve captured some right corkers for your viewing pleasure!! cookie to fall into her mouth. simply have nowhere else to go, but in there! From these last two shots can you guess who the winner was? Think you know? Then why not check out our video to see if you were right. Well, were you right? Do you think you’ll give this challenge a go? winner is the last girl balancing! How about this challenge? Care to take a guess as to who won this one? Did you get it right this time? Well that’s it from us for now and our Oreo Cookie Quest, I hope you enjoyed it! 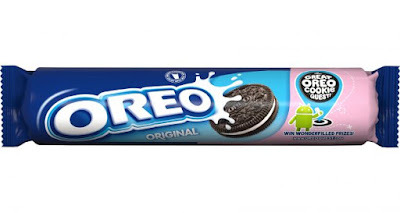 Oreo is celebrating The Great Oreo Cookie Quest promotion on packs now. win some great prizes, including a once-in-a-lifetime trip to California and the Goggleplex. with a perfect serving size of 2 Oreos per person. Quite often when we think of a BBQ, we think burgers, steaks, kebabs - but what about the dessert? With that in mind, this is wear my recipe creation came from. Add your desiccated coconut to the yoghurt and then serve!